So, I’ve took the nerve-wracking decision to quit my full-time job to fulfil my lifelong dream (at 25) of starting my own business. At the moment, I have a senior role at iProspect UK as an SEO Account Director. I have big-brand clients and a 6-person strong team where we go on our nerdy SEO adventures pretty much tell Google whose boss, obviously. In short, it’s great. 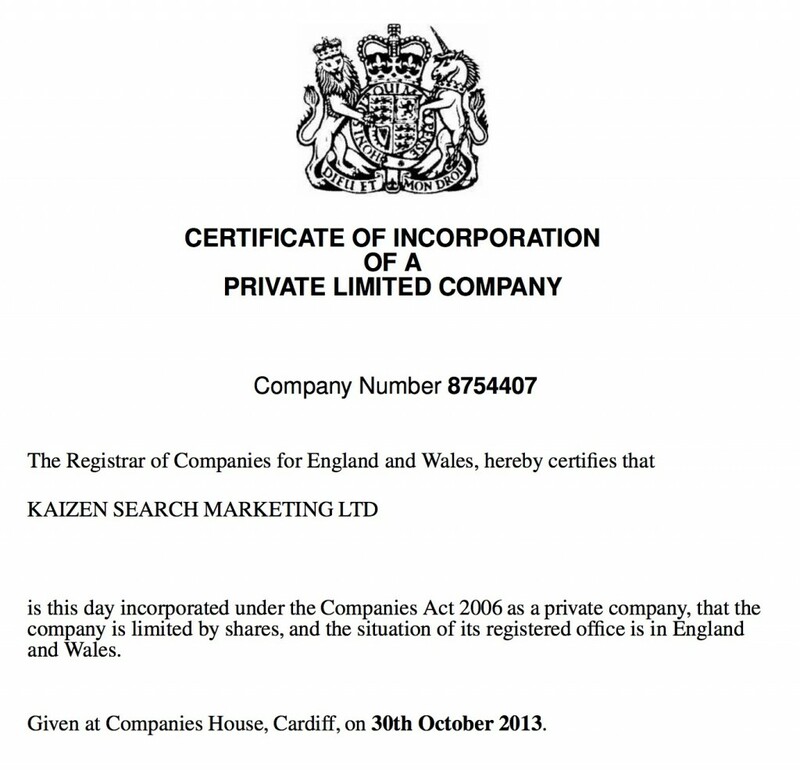 But, in the past year I’ve be given a few amazing opportunities outside of iProspect that will now form the basis of Kaizen, my own SEO agency, which I incorporated last week for a small £15 fee + £100 in capital. Kaizen (改善) means ‘improvement’ or ‘change for the better’ in Japanese. It’s also known as the process of continuous improvement in business, which I think is a great representation of what the very core of SEO is, and the way I try to work. To prevent the very realistic risk of becoming homeless in 2014, I’ve been saving like crazy to so that I can setup my little empire. I’ve raised a healthy sum of money in savings (or as I also like to call it, 6-months rent + beer money) providing a little window of financial freedom to really go for it. So what will make Kaizen unique? Especially when SEO agencies are progressively becoming as common as chip shops these days! Firstly, and I’m being a bit arrogant here – I believe that I am truly unique enough myself to standout from the crowd, with my own approach to SEO that’s fuelled by my nerdy background and experiences gained from it. Also, I think the most unique part of any successful business is it’s founder (think Mr Zuckerberg, Mr Branson, Mr Jobs). I grew up in the forgettable midlands, building my own websites from 11, the biggest of which (Kingdom Hearts Ultimania) drew 80K daily visits at it’s peak – purely because of it’s content, community and tireless hours of outreach that sparked tons of natural links. It was only 3 years after launching this site I heard of SEO, but in fact I had been doing it all along. I want to take the core of that philosophy and do it for businesses big and small. Now on to my second point. I feel there is a HUGE misconception in SEO at the moment that if you just make an awesome tool or a flashy, parallax scrolling infographic, the links, shares and eventually the rankings will just come. Google themselves are part-blame for this, and too many businesses are buying into the myth. The great secret of modern SEO is that it’s not just making amazing content, but having a killer battle plan in place to get that content in front of the right audience, thats what gets you awesome links. Although, it’s so tough to do right, but, I believe I’ve stumbled upon a few very original ways to do it. As a hint, it isn’t just sending a generic email to a list of bloggers begging them to post your infographic on “the history of toothpaste” – although I would definitely share that on at least MySpace. I’ll have to hold off for now on sharing what I have in mind (wouldn’t have much of business!) but from January 1st 2014, I’ll be living and breathing it. Good luck. Is your secret a google mole (they’re launching that in 2014 btw)? Best of luck Pete and to the future of Kaizen Search Marketing! I believe your new endeavor will be successful. Given your past experience, determination, dedication, and passion for SEO, you will make Kaizen a profitable (either money-wise or knowledge-wise) activity in your life. (I just sent you a message asking you an SEO question, using your site’s Contact Form. I hope you take a minute and reply). I’m actually launching my own Google, and all my clients will rank position 1. Best of luck to you Pete! You definitely possess the best qualities for this great endeavor. Indeed, the key to success for this type of industry is by just keeping things more natural. Your background and experience, as narrated, are well-established and enduring. Good luck Pete, I knew it was just a matter of time!